I love salads. In part because there are no rules. A salad is the perfect thing to make when you need to clean out your pantry or produce drawer. Salads are also great if you’re an expectant mom suffering from food aversions because of their flexibility. Distasteful ingredients can be easily swapped out for others that you find more palatable, if not dropped altogether. Can’t stomach garbanzo beans? No worries. How about cannellini beans or maybe some green lentils? Mushrooms make your face turn green? Perhaps some roasted squash is in order instead. And you know, I actually like to think of food aversions as food opportunities. When your formerly A-list foods drop to the D-list, pick up something completely new (to you) the next time you’re at the grocery store, and start experimenting with it. You can even start your experimentation with this recipe! Speaking of that recipe, the one I’m providing today happens to be vegan, which is perfect for breastfeeding moms with a baby who suffers from a cow’s milk protein intolerance, a common allergy in babies and children. I actually whipped up this recipe when my own daughter suffered from this allergy, which she (thankfully!) outgrew (See photo to right. I miss the hair). And this salad is so nutritious! It’s packed with kale, which has been hailed as a pregnancy “superfood.” One cup of it contains over 100% of the recommended daily value of three key antioxidants: Vitamin A, Vitamin C, and Vitamin K. Expectant moms suffering from constipation may find relief from its five grams of fiber. Kale also provides 15 percent of your daily value of calcium per cup. This dish is also quite high in protein, despite being vegan. This is especially important for pregnant or breastfeeding moms who struggle to get enough protein in their diets, either because they can’t eat meat or dairy or because they prefer to avoid it. 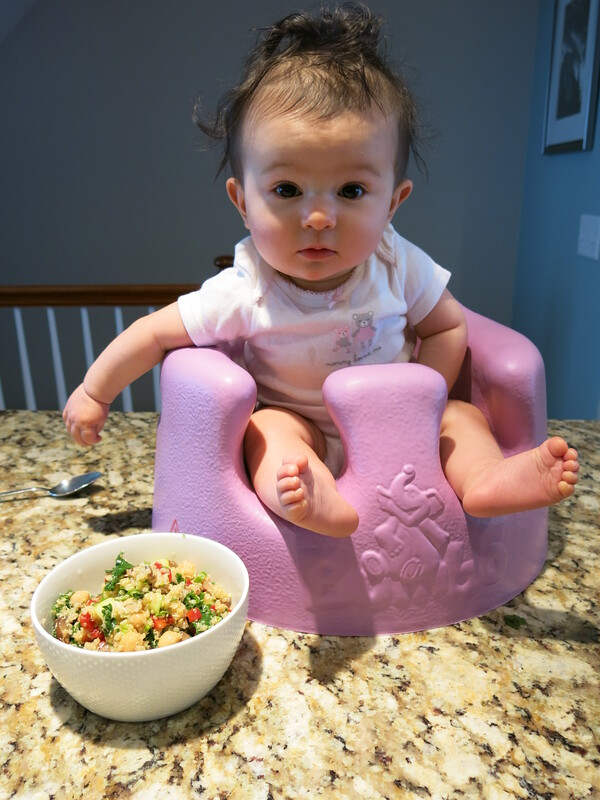 Owing in large part to the garbanzo beans and quinoa, the dish has 19 total grams of protein, which is 27 percent of the recommended intake for pregnant women and 42 percent of the recommended intake for non-pregnant women. Shortcuts: If all the chopping below sounds too arduous, don’t forget you can typically find your veggies pre-diced in the grocery store. I’m a bit of an odd duck – I find the chopping kind of therapeutic. 🙂 And frozen chopped kale works equally well as fresh. 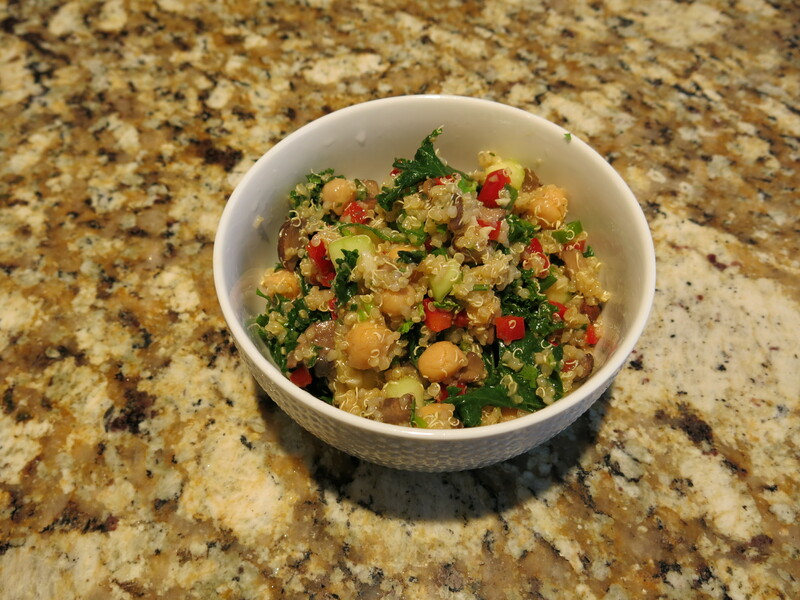 Combine cucumber, bell pepper, green onions, cilantro, garbanzo beans, and cooked quinoa in a large bowl. Set aside. Heat 1 tablespoon of olive oil in a saute pan over medium heat. Add mushrooms and half teaspoon of salt and saute for about 10 minutes, until mushrooms shrink to 1/3 their original size. Add 2 teaspoons of garlic and immediately turn off the heat. Stir 1 additional minute. Add to the salad bowl. Saute kale in 1 tablespoon of olive oil, 1/4 cup water, and 1/2 teaspoon salt over medium high heat for five minutes, or until desired doneness. Add 2 teaspoons of garlic and immediately turn off the heat. Stir 1 additional minute. Add to the salad bowl. Stir salad ingredients. Add lemon juice, lemon zest, and two tablespoons of olive oil. Stir to combine. Add additional salt and pepper to taste. Serve hot, at room temperature, or cold. *Daily values (DV) are for the general population. Women who are pregnant or breastfeeding need additional energy, particularly in the form of protein, than non-pregnant, non-breastfeeding women.